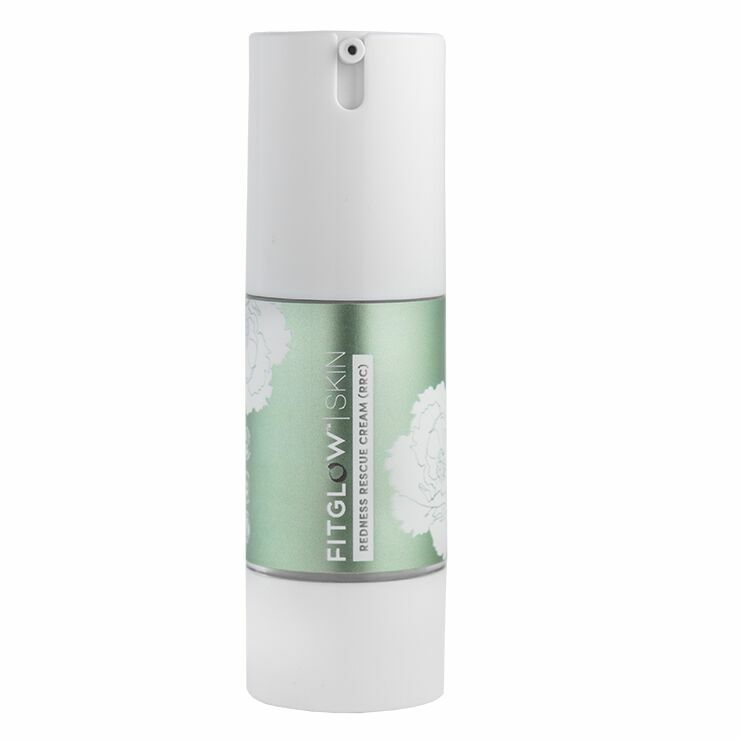 Calm the appearance of redness and inflammation with Redness Rescue Cream(RRC) by Fitglow Beauty. An innovative plant blend called c3 lends a reparative quality to skin, diminishing signs of inflammation. Wakame Seaweed Extract provides a healthy, vital look to the complexion. And green mineral tint counteracts the look of redness. This cream offers a feeling of essential hydration in a non-greasy formula. Apply the redness reducing face cream on skin over serum or moisturizer to give an even and hydrated appearance. Perfect for use as a base and primer for foundation or a natural no-makeup look. I have couperose, which can flare up after showering or face cleansing, toning or moisturizing - even when I am using the most gentle of skin care products. (It's so bad, I have actually started hand-making my own cleansers and face creams!) The Redness Rescue Cream definitely works, immediately calming the inflammation and evening my skin tone. Though pricey, you only need a small amount for it to be effective. I've been using it as needed for five months and still have a month or two left. I will definitely consider purchasing this again. I have read the other reviews, so there must be more women with a redness problem than I imagined. I don't know any. This product is so specialized, I have to wonder how it qualified as universal to be in a monthly box. I thought, even though I have no redness, surely it can't hurt me. Wrong. My face turned white, like a clown's and caused me to wonder about the ingredients. Because I could not read the tiny white print on the pink box, I had to go to the website to learn what is in this product. Oxides!! Several. The reason I don't use sunscreen. This product should be identified as a sunscreen. I will not use it again. Fortunately my normal yellow undertone returned by morning. It is also not a very moisturizing cream. No redeeming factors. I am disappointed a product for a specific skin condition was included in the box. Fitglow makes wonderful makeup. My first trial of their skin care leaves me very skeptical. BH is still my favorite box. I got this when it was part of the BH monthly box. Aside from being a great value, it actually works! I've used it a couple of times before today and liked it for the scent, texture, packaging. I had an unplanned meeting today which I wasn't looking forward to, as my skin has been acting up (red, mostly along the jawline and forehead, and puffy.) I wasn't sure what to use on my skin when I saw the bottle of this at the back of the shelf. I've been saving it for a while and it was perfect for an occasion like this. It took the redness away, especially on the jawline, and calmed my skin. There were still some blemishes visible but the overall tone of my skin was evened out. I think this would work really well for someone who has occasional redness or sensitive skin. I'm not sure how well it would work for those with severely sensitive skin. Overall, I'm pleased. I know I'll repurchase so I can have it for further emergencies. When I got the RRC in the monthly box, I wasn't quite sure what to do with it. My skin isn't red or sensitive. However, when talking with my teen daughter about how irritated her skin is after she joined the swim team, I immediately thought to give this to her. Upon the first application, she was in love. Her skin was visibly calmer and less red. Now, this is a staple in her routine. We will definitely re-order. I have type 2 rosacea and the Redness Rescue Cream has been a great addition to my routine. In the mornings I work out pretty intensely which triggers my rosacea, and have really red cheeks with red bumps for pretty much the whole day. Since I've added the RRC to my morning routine, it calms my skin instantly. I like to use it alone on the days I don't wear makeup or as a primer for the Vita Active foundation. So happy to have found RRC, it has been a blessing for my skin!